We are headed to Hotlanta! DSA will be at the 2010 International Window Visions Convention EXPO in Atlanta May 13-15 - and you can be, too! All DSA members will receive free VIP passes to attend the event being held at the Georgia World Congress Center in Atlanta. The show is being held in conjunction with the 2010 Southern Building Show. For the last 10 years, Grace McNamara Inc. has produced the world's largest window-fashions industry trade show. Show attendees include window fashion retailers, buyers, designers, decorators, workrooms, dealers, installers, fabricators, manufacturers, suppliers, architects, product developers, trend experts and students and faculty. The Southern Building Show, in its 17th consecutive year, is the premier building industry-attended event for the southern states. Attendees include builders, remodelers, architects, designers, developers, superintendents and specifiers. "Strategic partnerships are key for any successful event to thrive and grow," says Grace McNamara, president and CEO of Grace McNamara Inc. "We are excited to reach out to architects, contractors and builders regarding the value of window fashions in today's homes through our co-location with the Southern Building Show. "Co-locating our shows enables us to demonstrate the importance of window fashion products to a broader audience, benefiting our suppliers and dealers. By joining forces, we will expand the scope and vision of this event." Visit wf-vision.com for more information about both exciting shows. Click here to access your free VIP pass. To complete your certificate, list the DSA booth #1257 and company: Designer Society of America. 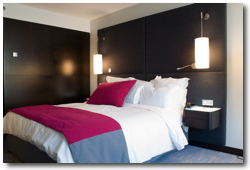 We can also help you get discounts at nearby hotels, so call us at 866-311-1372. Please let us know if you are coming so we can get together! Do you ever find yourself working non-stop for either success or even for failure. Now when I say failure, I don't mean you are intentionally working to fail, but you find yourself caught in a spiral of activity that isn't producing the desired results yet you are unable to stop, reassess, refocus and redirect your energies. Do you know what I mean? There are four critical actions to take during this time. These actions will allow you the essential opportunity to relax, recharge, refocus, redirect and remake your success plan. They will help you to avoid burnout or recover from it when you are already in the thick of it. This is scary for many business owners but necessary. Whether you will brave it for a weekend or a week, literally turning off your cell phone, and closing the laptop, completely ceasing business communications for 2 days to 14 days will make an enormous difference. Now, if you simply put an out of office message on your email, you will be inundated when you return and go through the anxiety of catching up. Instead I recommend your message share that you are out of reach and will not be checking messages left or emails delivered. Request that anyone who has a real need to contact you do so again once you are reconnected. This means you can delete (yes, I did actually say that!) all messages by voicemail and email that come in, knowing that when it is important enough whomever it is will be back in touch. Try it, it is very freeing. Too often as business owners we focus on what we didn't get done, what got left unfinished, loose ends and more. In my mentoring, I have created a progress report that starts with what my clients have accomplished in the last two weeks. This reinforces your sense of progress, direction, focus and achievement. Every time you are tempted to be swallowed by the black hole of incompletes, look instead at your list of completes, your list of successes! Showing 500K creativepreneurs* how to achieve unlimited prosperity by designing their own success, taking them from a "getting by" mindset to a making more, having more, giving more consciousness. Hosting semi- annual retreats for six figure creativepreneurs* featuring luxurious adventure that pushes them to dream bigger, live larger and give more. Creating a charitable foundation to serve creativepreneurs* globally in realizing their dreams of success based on their unique talents, big dreams and life changing visions. Each creativepreneurs* benefiting from the fund will in turn be committed to giving back, creating an endless cycle of renewing, reviving and recharging the dreams, lives and success of creatives worldwide. This is about going for a hike, relaxing on the back deck with friends, gardening, entertaining family, travel, sky diving or doing anything you find fun on a regular basis. Fun needs to become a part of your life's routine. Too often we get swallowed by our work and forget that the definition of a successful business is one that enables you to enjoy the whole of your life, NOT one that swallows you whole. I adventure deliberately to push me out of my business side, my head side and into another part of myself. This recharges me and inspires me. What inspires and recharges you? Get more great success habits and business growth tips at www.todaybydesign.com. And when you are ready to renovate your business success, skyrocket your sales, and put the passion back into your business, get your FREE strategy session at www.sixfigureprofessionals.com. Load Florida. Set to spin. Press start. That's what ASID, IIDA and their Florida-based puppet-coalition, IDAF, are doing to try and wash the truth out of the recent Florida court decision. In the past several weeks, we have seen concerted efforts to mislead the design community by misrepresenting the recent court ruling in which a judge struck down the title provision of Florida's interior design law and created significant new opportunities for nonlicensees to work in commercial settings by rewriting the law's practice restrictions. 1. Title Restriction Struck Down - Period. Before the court's ruling on February 4, 2010, only state-licensed interior designers were allowed to use the terms "interior design," "interior designer," "space planning," and other "words to that effect." Federal District Judge Robert Hinkle declared that provision unconstitutional and ordered the state not to enforce it any longer. How significant was that ruling? Alleged title violations have always made up the vast majority of enforcement actions brought by the State Board of Architecture and Interior Design under Florida's interior design law-about 80-90% since 2002. These cases usually involved a nonlicensee who was lawfully practicing residential interior design (which is specifically exempted from the practice act) and simply advertising that fact, accurately, on their business cards, on their website, or in the yellow pages. The State Board even went after nonlicensees for being identified-again, accurately-as "interior designers" in newspaper articles and in magazine profiles over which they had no control! I've said it before and I'll say it again: it was a modern-day witch hunt. Of course, the effect of the title law (the very deliberate effect, I might add) was to make it as difficult as possible for potential clients to identify these unlicensed residential designers. No Google search for "interior designer" or "space planning" would find them, and they could not be listed under the "interior design" heading in the yellow pages. But now they can. The cartel's censorship of the terms "interior design," "interior designer," "space planning," etc. is OVER. The public will now be able to find both licensed and unlicensed interior designers in Florida when they go online, or look in the yellow pages, or drive by a designer's business. Given the almost single-minded zeal with which the Board has been going after alleged title violations over the past eight years, the significance of that ruling cannot be overstated. And because the state decided not to file an appeal, that ruling is FINAL. 2. Florida's Practice Restriction Judicially Rewritten - Nonlicensees May Now Perform Substantial Work in Commercial Settings. As written, Florida's interior design law says you must have a license to perform interior design work-including space plans, designs, consultations, studies, or specifications-in any nonresidential setting. The sweep of that law is staggering. Indeed, it is reminiscent of Alabama's practice act, declared unconstitutional by the Alabama Supreme Court in 2007, which made it a crime for nonlicensees to offer advice about such mundane things as paint colors and throw pillows. In order to avoid the "substantial constitutional issues" (those are Judge Hinkle's words, not mine) that arise from a literal reading of the statute, the Board of Architecture and Interior Design abandoned its earlier interpretations of the law and asked the judge to simply rewrite the practice act however he thought necessary in order to uphold it. The result was an incomprehensible new definition of "interior design" in Florida that no one can understand and that will be virtually impossible for the State Board to enforce. According to the new definition invented by the Board's lawyers and the judge, "interior design" in Florida no longer includes spaces plans and other services relating to "stand-alone furniture" (whatever that means exactly-the court decision uses the term but never defines it) in commercial settings and apparently does not include surface materials, window treatments, wall coverings, paint, floor coverings, surface-mounted lighting, or surface-mounted fixtures in commercial settings either. So what, if anything, remains covered by Florida's commercial practice restriction? The only thing that remains covered for sure based on the judge's ruling is "fixtures," typically defined as "personal property that is attached to land or a building and that is regarded as an irremovable part of the real property"-things like non-load-bearing walls, ceilings, and HVAC materials. As to everything else-well, it's anybody's guess what remains covered and what does not. As specifically noted in the court ruling, this pulled-from-thin-air definition of "interior design" represents a new and "limited construction" invented by the State Board's lawyers "to obtain a favorable ruling in this case." Moreover, the judge specifically admonished the State Board that it would not be allowed to "revert to incorrect positions [read: correct but constitutionally problematic] it has taken earlier" and "will not be free in later cases to disavow the limited construction it has successfully advocated here." "I do not agree with the Judge's ruling and I cannot defend it. All I'm doing is telling you what I think it says. Bottom line, the practice act was saved but really had the legs cut out from underneath it." Does that sound like "victory?" Hardly. 3. The Cartel's "Victory" Celebration Is Not Only Misplaced But Premature. Besides having precious little to celebrate after seeing the practice act's "legs cut out from underneath it" in order to save it, the cartel's victory dance is premature because an appeal has been filed challenging Judge Hinkle's decision to save even a legless version of Florida's interior design practice act. "'Oh, nooo!' I hear many say. 'The Florida court's interpretation of interior design does not make any sense, and certainly does not correctly characterize the interior design profession.' This objection is most certainly correct." "I think things are more confusing after this opinion than before." And Board Chair Joyce Shore's reaction when she was told that the Institute for Justice had appealed Judge Hinkle's decision? "I am terribly disappointed but I am not surprised." Again, does that sound like victory? As usual, the cartel's rhetoric is totally at odds with the facts. So stay tuned, more of the cartel's dirty laundry will be cleaned. Frustrated with a lack of continuing education and resources for small interior design firms and solo designpreneurs to help designers succeed, seasoned interior designers Natasha Lima Younts - Founder of Designer Society of America, and Co-Founders of Design Success University, Gail Doby and Erin Weir, independently formed companies to provide practical and proven solutions specifically designed for the industry. Today, Lima-Younts, Doby and Weir announce their joint venture to provide innovative tools, online classes and mentoring by joining forces to expand their individual services and products to members of both DSA and DSU. Lima-Younts embraces the synergy and benefits of DSU's Business Mastery Membership with Monthly Mentor Classes, live Q & A sessions and Marketing Mastery Plans as a great benefit to her members. Her goal is to provide you with continuing education that is convenient and affordable. 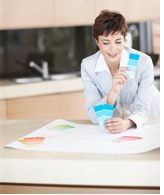 DSU also offers advanced training including their top-rated Value Based Fee System to create happier client relationships and more profit for interior designers that apply the system to their businesses. DSA & DSU's joint mission is to provide the support, education, community and connections that you need as an interior designer to be successful in your business so you can enjoy your passion…design. 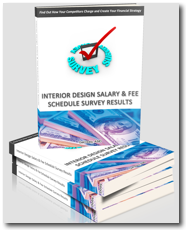 DSU welcomes the opportunity to mentor and support you, and as a special gift, offers their Interior Design Fee & Salary Survey eBook valued at $49. Just click here to download your complimentary copy now! Designer Society of America (DSA) is open to residential interior designers, space planners, kitchen and bath designers, re-designers and the trade companies that serve them. DSA provides a community for those already in the field, offering networking opportunities, consultations and mini Websites for displaying designers' work and contact information. In addition, DSA offers a mentorship program for new designers and as well as students studying the art at universities, colleges and technical schools. DSA provides designers with numerous opportunities to supplement income by participating in additional certification courses, study programs and continuing education courses. Design Success University (DSU) provides continuing education for interior designers who are serious about creating and growing a sustainable business. DSU offers accelerated learning opportunities, advice and mentoring based on practical field experience. DSU's classes and educational materials are delivered live and by recorded webinar, webcast, teleseminar, video, downloadable MP3 recordings, downloadable Powerpoint slides, downloadable PDFs and downloadable eBooks so you can listen, re-listen or read in your preferred learning style. DSU's purpose is to educate, inspire, motivate and support you so you don't feel alone. Judith Mahlin Carter has been transforming the art of interior design in Arizona since she opened Artisans Resource, a Scottsdale-based art gallery specializing in one-of-a kind, hand-crafted art objects, in 1991. Since then, the business has transformed numerous times in an effort to better serve clientele by expanding the services offered. Addressing clients' requests for a quicker alternative to conventional interior design services, Judith developed Design in a Day in 2003. Now she is revolutionizing the interior design industry once again by introducing SPACESplan® - a personalized, innovative and affordable interior design option, created in direct response to our ever-changing economic climate. 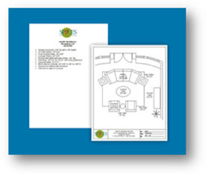 SPACESplan® is a comprehensive, step-by-step, "how-to" guide for those clients wanting to "design-it-themselves" (with a little professional assistance). Each plan is tailored to the client's specific needs, allowing them to put their own "thumbprint" on their interior design. Judith is thinking out of the box in a challenged economy. We are saluting her creative ideas! Begin with our 1-1/2 hr Start-Up Consultation for only $295. Spring is here and it is definitely showing new growth, even at DSA. I am finally getting settled in and getting to meet many of you on the phone and through email. However, my favorite way of communicating is through social networking. Yes, I have to admit, I am addicted to Facebook, and it has joined my morning routine in between getting my cup of tea and checking my cell phone. Facebook friends have diagnosed my child's rash, found a TV repairman that makes house calls, helped find my neighbors lost dog, invited me to more yard sales and swap meets than I can name and gifted me with more Mafia Wars, Café World and Farmville gifts than I could possibly imagine. But it has also been the greatest form of communication and has reconnected me with 30 - 40 of my old classmates from as far back as elementary school, old out of touch college buddies, old church friends and even family. I was ecstatic when I found my cousin, Jackie, after 20 years. We lost contact when my parents divorced and we moved from Pennsylvania to Georgia. She got married a few years later and I did not know her new name so I could never find her…until Facebook. Now, your DSA has its own Facebook page! (Yes, it was my idea). Please join our page and feel free to post your comments concerning all your interior design needs. Then other members can offer you their advice or feedback. I also keep all the current DSA news updated. So I would love to invite everyone one of you to "Become a Fan" of our Designer Society of America page. Last month, I asked for feedback in what you want from your interior design society, and I got many responses. Keep them coming! The portfolio contest prompted many of you to get your portfolios up on the website to display your work. We will be announcing the winner of the contest in our May newsletter, and the winner will be featured in our June newsletter. Be on the lookout for our chapter groups, more exciting information is coming soon. Lastly, if you haven't had the chance to check out Design Specifier, it is now available through our website and is an awesome online tool to aid designers in project management, invoicing, and other document creation. So enjoy the beautiful spring weather and I'll see you online! Black and white with a dash of red has long been a wardrobe favorite and the eye-catching combination is now also a favorite for the home. The combination of black, white and red color is clean and contemporary yet appeals to our desire for glamour. This color trend emerged in Europe in the last two years and this year has truly taken hold here. Recently House & Garden magazine featured Jade Jagger's (daughter of Mick Jagger and wife Bianca) home in London with her comfortable white furniture, sporting red and black pillow set against a red carpet. Jade is quoted as saying, "It is my favorite color combination. There are many reds to choose from and all are a beautiful complement to black and white. So whether you favor a bright apple red, a deep claret or prefer a more muted burgundy, the hue will work with black and white. 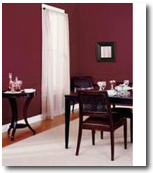 For the rich and sophisticated look shown in the picture above, try using Brunt Tile 150F-7 for the walls and White 1852 for the trim from Behr. Best of all, this combination is available from many sources in everything from rustic wood stained black cabinets to luxurious red upholstered chairs so this sophisticated trio can fit any decorating style. Kate Smith, founder and contributing editor of Sensational Color is a color expert, strategist, engaging speaker and host of Views on Hues. In addition to the color services she provides for many corporations, Kate shares her knowledge of color on her website Sensational Color and blogs: Color For Your Home, Color Pro and Live In. Last month I gave a brief overview of the book "Environmentally Responsible Design," a reference book to help provide a foundation for understanding sustainable interior design. This month I'm recommending "Women in Green," a compilation of conversations with women involved in sustainable design. 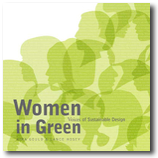 "Women in Green -Voices of Sustainable Design"
"Women in Green, Voices of Sustainable Design" is a powerful little book. Little because it is only six inches wide by seven and a half inches long, giving a clue to the personal feeling of the narrative and possibly a reflection of the personal nature of the feminine voice being expressed. The book begins by reminding us that the history of environmentalism is rooted in the work of women like Rachel Carson and Jane Jacobs, and both are acknowledged in the beginning of the book. The definition so commonly used today for sustainability was authored by the Brundtland commission led by a woman, Gro Harlem Brundltand, then Prime Minister of Norway. Although I've read parts of this commission report and quoted it in articles on www.easytobegreen.com , I didn't realize until recently that Brundltand is a woman. The focus of "Women in Green" is the influence women have had and potentially can have on sustainable design. This book is powerful because it is packed full of concepts about sustainability, women's roles and influence, environmental history, and possibilities for our future. Many of the ideas are ones you have probably already thought of or heard about. Still, many are historical references that will entice you to learn more. Other ideas were for me so fundamental that they created "light bulb" clarifying moments that I expect will simmer in my being and provide the springboard for growth and change. If it's possible to single out one idea that really grabbed me, it would be this: Environmentalist Winona LaDuke was quoted as saying, "If you're not at the table, you're on the menu." Being at the table means we have a voice. A voice we can use for ourselves and for the voiceless people in developing nations, for plants, for animals and for all that we value that is being put at risk with the status quo. Of course, keeping ourselves off the menu...now that's a personally powerful reason to join in the work for a more sustainable tomorrow. I do recommend you read this book and strengthen your seat at the table. "Women in Green - Voices of Sustainable Design"
DSA is a national organization committed to the success of residential interior designers. 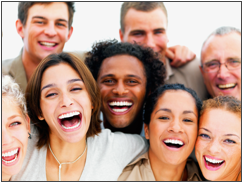 Professional individuals who thrive in this magnetic and dynamic creative industry belong to Designer Society of America. Feel free to contact us.